Happy New Year! Long time no blog. So today I want to take us to the Bake Off tent. I wonder how many of you, like me, have the tendency to live life a bit like a contestant in the Great British Bake Off tent. NOT in terms of the amazing baking you do – not to imply anything whatsoever about your baking! – but in terms of your perspective on whatever it is you find yourself busy with. It’s a cake by the way not a sandwich! The problem is that given a certain temperament, level of skill, a set of expectations (perceived or actual, coming from others or ourselves…) there is a cohort of us who – at least in part / on some level – are actually aiming for the end of each day to look pretty much like the scene above: a near perfect something to show for our efforts ready to be appreciated and validated by those who know about these things, and with all the mess and bother a thing of the past. A tangible triumph. Perhaps we would aim to have our children sitting up there swinging their legs, happy and eager to chat through the family devotional we had earlier in the day? Maybe we would are looking to produce a spread of nutritionally balanced food that has been enjoyed and appreciated? Or is it a thriving bible study group or one-to-one? A husband feeling tenderly loved? A well organised to-do list? A product from your craft or paid work – a patient you have really invested in and treated successfully, a brilliant diagnosis, a best seller, a positive comment from a colleague or mentor, a promotion, a qualification, a pupil who has come on leaps and bounds under your care….? Or a session at the gym / long distance run with all the right stats? Even more worrying is that we might well be aiming for an element of all or most of those! But what if we are in fact not contestants in the Bake Off Tent, but children making mud pies in the garden? no wonder we feel depressed when we end up with this! But what if we are only meant to be making mud pies? What if we could be happy with an end of the day which looks more like this? Which doesn’t give us permission to be lazy, slapdash or thoughtless; or to cheat people by being casual with their time, or the tasks they have entrusted to us. Nor does it diminish the value of what we do. It doesn’t render what we do unimportant or meaningless. No way! Those mud pies are to be made to the glory of God. But it does mean that we need to remember that what’s at the end of the bench when time runs out is God’s domain – his masterpiece. We need to put aside our Bake Off tent perspective on our days and jobs and pick up the perspective of small, eager children helping and trusting their talented, patient Father. You see – and this makes all the difference – our Father takes our very dishevelled looking, odd smelling, uneven, misshapen, sunken, overcooked, under-cooked, salt put in instead of sugar, piece of the baking paper baked into the cake, scraped off the floor….. creations and (jaw-droppingly) smiles in satisfaction and delight. Why? Because he has just the ingredients he intended at just the right time for the showstopper to stop all shows! Or to mix my metaphors into my cake mixture – he takes our mud pies and lovingly plants a seed from which grows the most beautiful flower ever known. The pressure if off and the praise is on! – and I mean about Pokemon or Beast Quest not life threatening emergencies! is to explain that my head and heart are already full and anything else poured in is just going to pour over the top and make a mess! It seems to be a helpful image for everyone concerned. The question I have recently been asking myself is what is hanging around in the jug to make it so full? Often it is quite reasonably the actual task / conversation I am having already involved in. Here the lesson is quite simply about interrupting; pausing before launching to check if I am clearly otherwise engaged. But sometimes my fullness is less obvious to them, and in fact to me. I am basically interrupting myself all the time – wantonly adding more to the already full – oblivious to the growing puddle around me. While this self-inflicted mess seems to be acceptable for a while, the slightest drop any one else tries to add in is totally intolerable and is given short shrift. And so I have decided to get better at either emptying my jars as I go along, or screwing on a lid and leaving it elsewhere. It is a similar concept to my brain receptionist from a while ago, but it seems to be sitting within a more practical reach for me to access helpfully. As I drove back from a meeting yesterday evening I prayed about the things mentioned, mentally noted the three things I would type up and then turned the jar upside down. Today when the All or Nothing wanted to play with me, I screwed the lid on the jar I had been filling, and got out a new one to enjoy filling with him. I have one jar at the moment which is quite exciting and pressing and unknown and has a tendency to keep on dripping all the time – in other words it presses in on my consciousness regularly. So here I need to be really careful that I don’t let it drip into whatever I am meant to be concentrating on! Otherwise, before I know it drips from all sorts of places are all filling the same container and I suddenly have a bath tub full of water and just need to let the plug out! No idea if this makes sense to anyone else, but the drips thing seems to have stuck in my imagination. Another helpful image has been the 20% / 80% one. Which states that we generally get 80% of a job done in the first 20% of the time we give it. To get the last 20% takes a really disproportionate amount of time. So we need to be really choosy in what we decide to take beyond 80% in a day. We need to identify the tasks that we are really happy to just get to 80% on and then totally turn off all drips from that source. It is not an unfinished task, incomplete, failed or inadequate – it is just not a 100% task. It can have a clear tick next to it despite ‘only’ being 80% because that is all it needed to be. In the course of the day you might even have to downgrade tasks to 70% because as you weigh things up that is all it is going to get / all they need as compared to something else that has cropped up. The thing is that those tasks are just as much done as the odd 100% task we achieve. It seems so simple – possibly even lazy – to stop at 80%! But actually, keeping on doing something can sometimes just be the easier option. Having the discipline to stop and shifting myself to do the next thing well and with full attention takes more effort. Lord, please help me to be better at giving the tasks, and more importantly the people around me my full attention for the right amount of time and to leave what I don’t get to, haven’t managed or just have to abandon in your hands. Help me to discern where that final 20%, that extra work / time is valuable and a good investment and where it is just pride or inertia. That you Lord, Amen. Due to an internet problem the post Church Tent-ions was published from an earlier version. You will have been sent this incomplete version – please read the completed version below! As my regular readers will know, my recent focus in this blog has been on my mental health and parenting. But what of church life? The sad truth is that the congregations of the churches where my husband in the vicar are dwindling. The rotas and committees and structures are slowly collapsing. Well of course that’s a huge question with lots of different answers. It is also a question that I care passionately about, that has massive implications for our ministry and our family, but that I have little structural ‘right’ to comment on / have an opinion on amongst those with the power to do anything about it. Which means I’m going to tell you all about it and then I can at least imagine that someone is listening! – or rather what I feel as it is more of a splurge than anything else:. Over the past (several???) hundred years the central pole holding up our tent (i.e. the visible church) has been cultural religiousity; and for a long time this pillar of religion has done a ‘good’ job of holding things up – and an even better job of disguising the spiritual reality. In our lifetime, however, it has shrunk and crumbled dramatically (although at the same time imperceptibly) – and today we ‘suddenly’ find ourselves standing in a tent being held up by the tallest person’s head. Why suddenly? Because, whilst the societal norm of going to church twice a Sunday and giving to the church regularly (if not necessarily cheerfully) is long gone, the residual ‘benefits’ of that have lasted much longer. The pole has gone on functioning relatively ‘well’ whilst those residual effects have remained, masking the structural decay going on behind the scenes. For a long time there has been a large and active generation of people who grew up in a strongly religious culture and for whom it was still their norm. In addition their children were still quite heavily influenced by the culture their parents had grown up in – all be it a bit diluted by their own cultural norms. Christmas and Easter, harvest, remembrance, baptisms and confirmations still drew a crowd and filled the coffers and gave us a sense of strength and purpose. There was still a sense of connection with church (if not commitment and belonging) that kept people giving – if not on a Sunday morning, or in a regular way – at least at the church fund raisers. But it was just a matter of time. Now we two generations on from that and it is the influence of great-grandparent’s that we are relying on – an influence that is inevitably diluted by the generational gap and which is competing with new cultural norms that are increasingly distant from even the most nominal Christianity. Not only does the average person not have much of a sense of connection to the church, but they are more and more likely to find its teaching and existence at best alien and at worse offensive. At the same time the stalwarts are struggling – in so many ways. Their numbers, health and strength are diminishing. They are at ‘best’ very discouraged, and at worst increasingly ashamed of the cultural norms they used to cherish and confused as to what they should be holding on to and what they can let go of. Today it is as though in each of our tents there is an ever decreasing team of people left desperately holding their hands up high to stop the tent collapsing completely. Which is a scary, tiring, heartbreaking job! But one that it is very hard to stop doing. No one will change or move a muscle in fear that the whole thing will collapse. The idea of those of us remaining gathering in just one tent is not to be contemplated. So the plan seems to be for everyone to keep going until they can’t keep going. And who knows what then? I thought that what these tents needed was a better tent pole. A gospel pole. But it has been rejected. 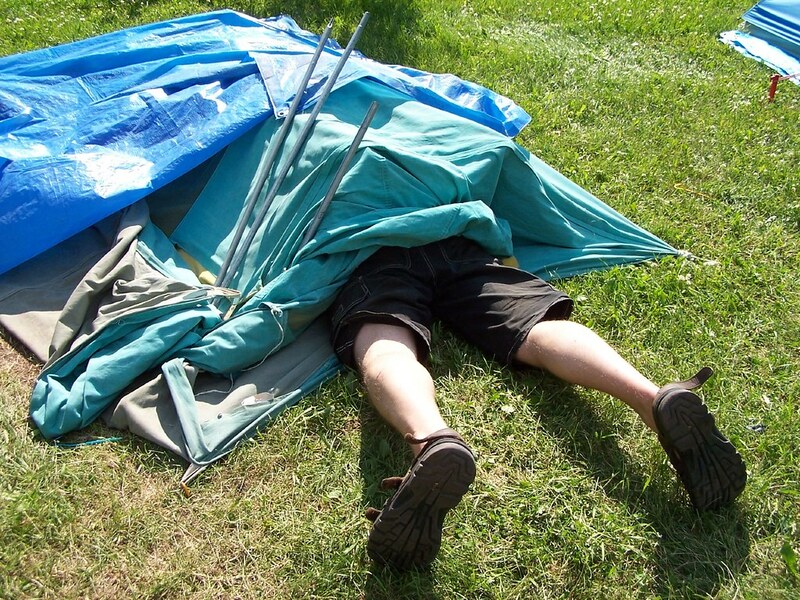 It has been sidelined to the bits that ‘don’t matter’ (small groups, evangelism, school’s work…) Even there in the corner of visible church life the gospel is unwelcome to those who control the frame of the tent. Key holder-uppers have abandoned their post and those who remain are even more antagonistic, even more committed to their ever decreasing pole of religion. And so we have a very saggy visible church! And who gets the blame? That dangerous gospel pole and those dreadful people who insisted on trying to strengthen the church with it. So what shall I do? Pray and love and trust. 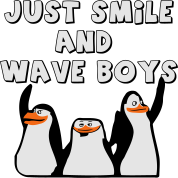 Repent and serve faithfully, hand over each betrayal, each thwarted opportunity, and of course if all else fails – just smile and wave! Dear God, I can’t imagine what sadness our church must bring you. It is not a pretty picture – and I’m talking about the lack of numbers, and money, but the lack of love and unity. I’m sorry for my part in its ugliness. For my impatience and lack of love, for my arrogance and for my lack of trust and prayer. I’ve been sighing over this in despair rather than breathing in your strength and breathing out my need to fix it all. I have been testing you in my heart by not trusting you in my heart. I have been cross and unloving and ill at ease. I have been panicking rather than praying, accusing rather than loving. May there always be a light in my eyes and a smile on my lips because of you! Help me Lord. In Jesus’ name, Amen.